Colour for Life is a nationwide fundraising campaign to give hope and help the children infected and affected by HIV initiated by L’Oreal Professionnel and the Malaysian Aids Foundation. 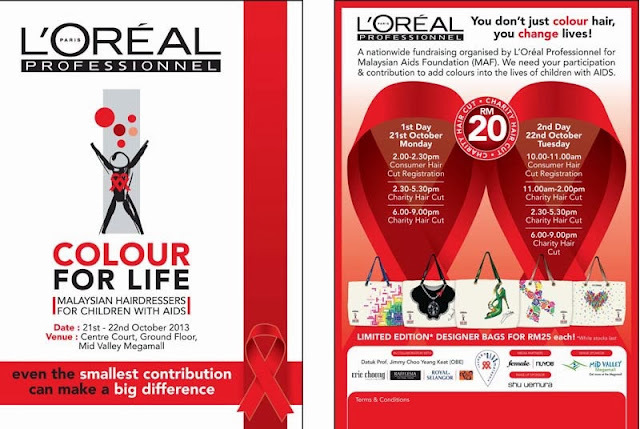 I was glad to know that L’Oreal Professionnel being the No 1 professional salon brand cares about the well being of the society we live in. This campaign also strives to create awareness and reinforce the idea that each of us, no matter which industry we are in, who we are, where we come from, can in one way or another make a difference in the lives of these children. 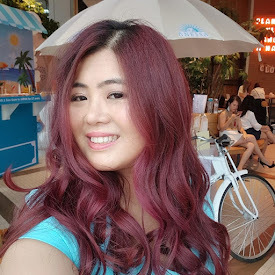 As a blogger I also want to make a difference by sharing this in my blog! 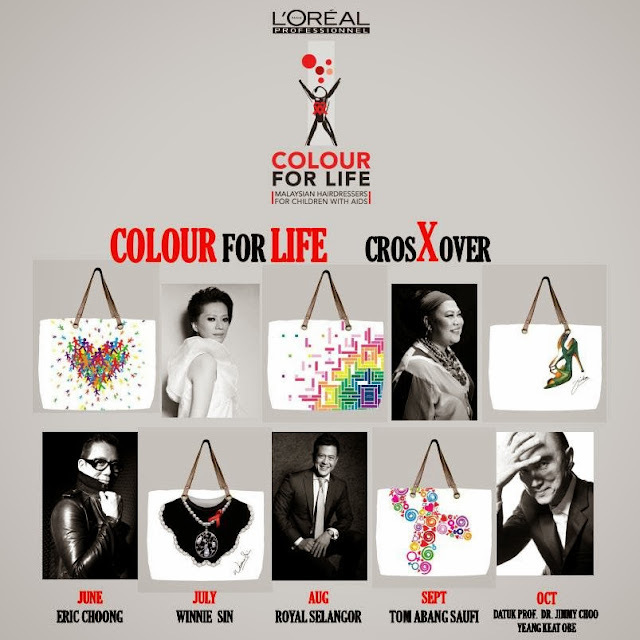 This year L’Oreal Professionnel have partnered with 5 renowned designers, each a maestro in their own craft and to design an artwork each for the campaign. They are Datuk Professor (Dr) Jimmy Choo Yeang Keat OBE, Royal Selangor, Tom Abang Saufi, Eric Choong & Winnie Sin. Not only that, the 5 designs will be worn by 26 renowned personalities such as Datin Paduka Marina Mahathir, Dato Ruby Khong, Deborah Henry, Carmen Soo, Fahrin Ahmad, Mizz Nina, Deanna Yusoff, Yeo Yan Yan, Jack Lim, Gillian Hung and many more who are maestros in their chosen path of life and also people who is very charitable and willing to do their part for the children despite their success and busy schedules. Not forgetting L’Oreal Professionnel Artistic Ambassadors - Kevin Woo, founder of Centro Hair Salon, Miko Au, founder of Miko Galere, Albert Nico, founder of Albert Nico Boutique Salon, Andy Chan, founder of Andy Chan Hair Studio and Simon Koh, founder of ELLE Hair Studio are also involved in this campaign whereby they coloured and styled the hair of the chosen personalities for the photo shoots. 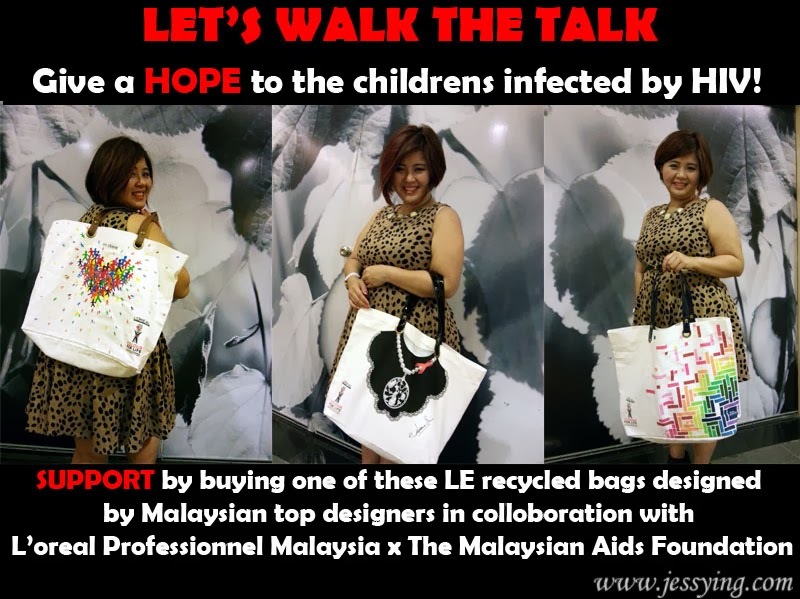 L’Oreal Professionnel have replicated these exquisite designs into limited edition recycle bags so that the public can play a part in this good cause! Not only these bags are so beautiful (environmental friendly too!) and it also gives a HOPE to the children infected/affected by the world No 1 killer according to WHO! 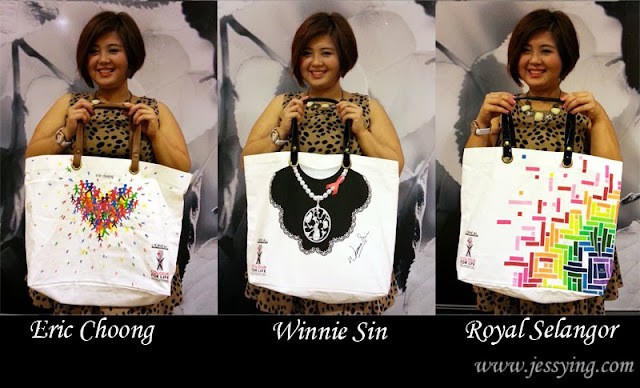 My favourite pick : I love Winnie Sin design, what about yours? Come let's us play our part today in helping the children of the Malaysian Aids Foundation today by just donating RM25.00, you can get your favourite limited edition recycle bags at the nearest L’Oreal Professionnel Salons near you today! 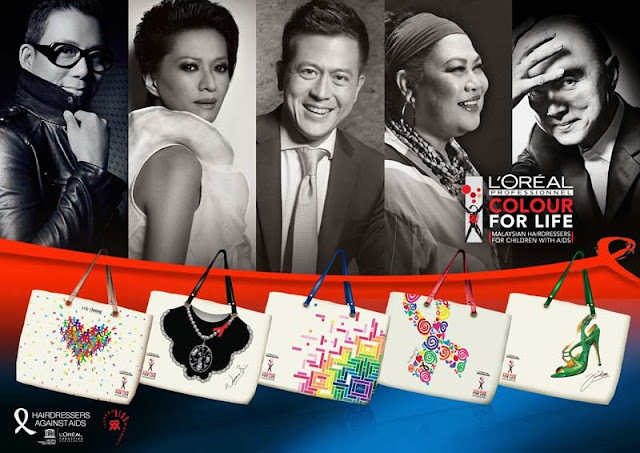 Collect all FIVE today as these are limited editions are they are for a good cause ya! This is where professional hair stylists will cut the hair for the public for only RM20.00 (super cheap okay!!!) f course I will be going for sure to trim my hair and why not you all come along, get a brand new look for the year end while making a difference in the life of this children! Together Each Of Us Can Make A Difference.